Auditory Sign #1: Do I Hear Popcorn? Note: This post was originally published on 12/07/12. Due to popular demand, we’ve thoroughly updated this post with more comprehensive and current information. Major update: 9/1/16. Last updated: 2/7/17. When you see some water on the floor near your water heater, understanding where your water heater is leaking FROM matters. Failure to understand what to do when your water heater is leaking could result in a dangerous situation. If you notice condensation on your water heater, this is typically normal. However, condensation looks different on standard (atmospheric) water heaters than it does on high-efficiency water heaters . Most high-efficiency water heaters are “sealed combustion” units that gain efficiency by extending the path the combustion gasses travel within the water heater, slowing them down to make use of as much of the available heat as possible. This process generates condensate as a result, that is then discharged through a condensate drain near the bottom of the tank. So, condensation is a healthy sign for high-efficiency water heaters! Standard atmospheric water heaters typically do not produce condensate, though drastic differences in temperature between the water tank and the air outside the unit can sometimes result in condensation on the outer jacket. This will happen within minutes of first installing any atmospheric water heater. After that, condensation will typically only occur if all of the hot water is used in a short time and the tank is refilled with water colder than the surrounding air, similar to a cold beverage on a warm day. Condensation is normal and typically not a problem or an early sign of water heater failure. Be sure your basement or room where your hot water heater is kept has proper drainage. Image courtesy of the Wikimedia Commons – from user JohnnyMrNinja – licensed under CC Public Domain. When you see water on the floor near the side of your water heater and/or dripping from the pipe that runs down the side of the unit, this means your temperature and pressure (T&P) valve is venting excess steam. This steam condenses into water, which travels down that pipe and into your floor drain, preventing your water heater from exploding. A slow drip from the T&P valve is normal. If you’re concerned that there’s a large volume of water coming from the T&P pipe (or elsewhere), it’s time to call a trained water heater technician. A constant flowing stream can be an indication that the T&P valve is faulty or broken. If the seal has broken, it will leak water, compromising the integrity of this vital safety feature. Again, always call a trained water heater technician if you suspect a problem with your T&P valve. DO NOT tamper with the T&P valve. A T&P valve that is capped, blocked, missing or broken cannot release built up pressure, which could cause your water heater to explode. 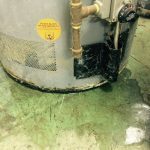 In the commercial water heater industry, there’s a reason we call a failed water heater a “leaker.” When that water heater is leaking water from the bottom of the tank of a standard atmospheric water heater, it’s a sure sign you’ve got a leaker—meaning your water heater is about to fail completely, and SOON. When water is leaking from the base of the water heater (or if you notice water on the floor under the water heater), that means your commercial water heater is leaking internally. So your water heater is losing the water it’s supposed to be heating. This can happen slowly over time, or very abruptly. This is because when that water heater tank heats up and cools down, the metal expands and contracts. Over time, hairline cracks can form in the tank itself or in the flue tubes inside the water heater, causing water to leak out onto the floor. Note: Typically, only standard atmospheric water heaters become obvious leakers. Many high-efficiency (sealed combustion) water heaters can become leakers without any advance visual signs. High-efficiency (sealed combustion) water heaters do leak, but these units have the combustion chambers at the bottom of the unit, so when an internal tank leak develops it leaks into that combustion chamber under the tank and can’t be seen from the outside. Instead, the leak will typically extinguish the burner, preventing the heater from firing. Unfortunately, the only solution to any leaker is a replacement. If your high-efficiency water heater is displaying an error code or is “locked out,” refer to your manual for the diagnoses code to help ensure your water heater technician is prepared for your service call. If you notice a lot of corrosion around the pipe fittings attached to your commercial water heater, this indicates that water is leaking through what should be sealed pipe fittings. Pipe fitting corrosion occurs because mineral deposits from the water are seeping out through the gaps in those pipe connections. This is often called a “slow leak,” which means your water heater might be able to limp along for a while, but it could definitely fail if the problem isn’t addressed. A slow leak through the pipe fittings or along the bottom of the tank welds is a sure sign of imminent water heater failure. You’re lucky your water heater has a little time left, but don’t delay. You’re going to need a water heater replacement SOON—it’s just a matter of time. Even if the leak “seals itself shut” with sediment, that sediment will also soon crack, and then you’re looking at a full-on leaker. Contact a professional commercial water heater technician. Burn marks could mean improper water heater venting is causing backdrafting. This is a serious problem that requires urgent attention and repair because this means you’ve got natural gas and exhaust fumes that aren’t exiting your building, as they should. Instead, those toxic fumes are seeping into your establishment. Not a good situation. If your issue is improper venting, there’s likely no need for water heater replacement—you’ll need to call a plumber to get the venting fixed. However, if the venting isn’t fixed, your water heater WILL fail prematurely (as will subsequent water heater replacements)—so don’t wait! Click here for more information on water heater venting. Burn marks can also indicate that the flue pipes (located inside water heater) are blocked or damaged. This is also a potentially unsafe situation, so that water heater will need to be replaced – and soon. You’re going to need a water heater replacement. Call a professional ASAP. In this case, cleaning or replacing your water heater’s burner is likely the only repair you’ll need. However, if you see a yellow flame in conjunction with burn marks (as noted in Visual Sign # 3 above), that’s usually an indication there’s not enough make-up air available, as it can be a sign the flame is starving for the air it needs to burn hot. Auditory Sign # 1: Do I Hear Popcorn? The most obvious auditory signal that your standard atmospheric water heater is about to fail is when it starts to sound like a popcorn machine. This popping noise is from an accumulation of honeycombed mineral sludge, caused when that water heater has to take on hard water. Water trapped in that honeycomb becomes super-heated because the sediment layer forms directly above the heating element, so it flashes off into steam. That flash-boiled water is causing those pop POP popping noises. Eventually that sludge is going to stress your water heater tank, causing a leaker – and you’ll need a replacement commercial water heater. Those loud popcorn sounds are also a sign that it’s time to invest in a water softener! Without a water softener to filter out that mineral sludge and gunk, your water heater tank becomes extremely inefficient and more prone to a shortened life and impending failure. If your water heater setup has a blower motor attachment on the water heater itself, and that blower motor is unnaturally noisy and just plain LOUD, that means the blower bearings are about to fail. Here’s the thing: when that blower motor dies, your water heater won’t work. Why? Because your water heater is equipped with a failsafe mechanism that prevents operation in case of blower failure. Note: All high-efficiency (sealed combustion) water heaters have blower motors. If you have a standard (atmospheric) water heater, unless you may have a hybrid power-vented setup (not common), you mostly likely do not have a blower motor. Unfortunately, sometimes blowers are just loud. It could be your water heater is simply working hard. Listen for a distinct sound of rattling/tinkling/clinking metal. If that’s what you’re hearing, you may need your water heater’s blower motor replaced. So the moral of the story is when you know and understand the visual and auditory signs of looming commercial water heater failure, you may be able to prevent a no hot water emergency situation before it happens. The more you know about your commercial water heater, the more likely you’ll be able to stay in hot water, and the better off your restaurant, hotel, apartment, or other commercial enterprise will be in the long run. Featured image courtesy of Wikimedia Commons – licensed under CC Public Domain. can you tell me if your pipes seem to be under pressure and you turn off the water suddenly and it makes a loud sound, would that cause the water tank to fail. you mention a “honeycombed mineral sludge”. my water heater seems to be “spitting out” a sweet sticky substance at the bottom where the valves and other wires are located behind a removable metal guard covering this area. my plumber has never seen anything like it and thinks that i may have spilled something sugary on the heater. (not likely at all) what is this substance and why is it coming out of my water heater? Antonia, here’s our best guess: When you say “located behind a removable metal guard covering this area,” it might mean there’s a gasket leak in that area and the water may be combining with the insulation of the tank. The insulation (especially on older equipment) when wet can become sticky. This is just a guess though. We officially recommend you seek the advice of another plumber who can do a more thorough inspection on site. My hot water heater makes a sssssss sound like it is relieving pressure. Is this dangerous? What can I do ? That’s a noise that should definitely be investigated by a professional in person, because it could mean different things. It could indicate that your heater has developed a small leak at the bottom – water dripping onto the burner can cause a flash boil which makes a noise similar to what you’ve described. Unfortunately, if you have a leaking water heater, it will need to be replaced and it’s best to replace it before that small leak gets bigger and the whole bottom drops out. Alternately, water heaters do have an important part called a T&P (Temperature & Pressure) Valve, designed specifically to relieve excessive pressure as a safety precaution. However, the noise you describe is not a noise that valve should make, so if the noise is originating from here you need to call a plumber to inspect your heater for trouble that could be causing a pressure buildup (which yes, can be dangerous), and/or to determine if that valve needs to be replaced. In either case, your concern is valid and we recommend having a professional inspect your equipment as soon as possible to prevent a bigger issue. Good luck! My water heater has been dripping water recently. I don’t know what that means but I am happy to know that I should get it looked at. I like that you mention the differences for the leaking so that I can explain it to the plumber when I call him! Nice piece of information shared. Thanks. So glad you found it helpful – thanks for reading! You mentioned that “understanding where your water heater is leaking FROM matters.” That is something that we are a bit concerned about right now. We noticed that our water heater was leaking a couple days ago but can’t figure out from where. We will have to keep this information in mind and hopefully be able to fix whatever isn’t working properly. Thanks for reading, Danni! We’re glad you found this useful. Yes, identifying the leak source is pretty vital. We wish you luck in finding your source and hope it’s one of the easier situations for you. I had no idea that it was so important to regularly check your water heater. Like you explained, small leaks can lead to very big problems. I imagine that without checking your water heater regularly it would be very hard to spot those small leaks until there is mold growing and it is almost too late. Now that I know the importance of checking the water heater I will make sure that I do so more frequently. I’ve noticed a lot of dripping water coming from my water heater! I thought it was just the pipes! Thank you for letting me know it might be a sign that I need to repair my water heater. I’ll make sure to take care of it as soon as possible. Thanks! Thank you for this article..our electricity was off for several hours yesterday when it was turned back on the electric hot water heater started popping so loudly , it was scary. I was about to google the problem and it suddenly started gushing water. The heater is located in our hallway with hardwood floors. I immediately turned the water valve off so flooding wasn’t too bad. I had never experienced this in all my 64 years. Will be getting new hwh tomorrow. Thank you so much ,now I understand the problem and what to do to prevent future damage. Wow, what an experience! Unfortunately, sometimes all it takes is a simple event like a power outage to trigger a problem like that. Sounds like the sediment buildup in your tank was probably keeping the weld sealed – for who knows how long – but with the longer power outage the water inside the heater got cold for long enough that the metal contracted and the sediment shifted. So once the water heater came back on, the sediment started popping as it was heated and the metal expanded again and just like that the seal finally gave out. So sorry you had to go through that, but thanks for sharing your story! I’m glad our article was able to provide peace of mind during a stressful situation. Good luck with your replacement water heater! Hi Mark, Good question. From your description, it sounds like it’s likely a bad T/P valve. We definitely recommend changing that out, because once the valve begins leaking consistently, it needs to be replaced for safety. And that’s a relatively inexpensive part to replace, especially compared to the cost of a new water heater. We suggest calling a professional if you don’t know how to safely change this valve yourself, as there’s specific steps to follow to ensure it’s done properly. If you still experience the same issues after replacing the T/P valve, then it might indeed be the end of your heater and it’s definitely time to call a plumber. We hope this helps, and good luck! My gas water heater is almost 10 years old and was working fine until a week ago when I noticed it backdrafting. You mentioned to check to see if the flame is yellow.I did this and I can’t really see a yellow flame. My vent is installed correctly as there were no problems before.Is it possible that it isn’t burning hot enough and even though the flame appears normal that if I replace the water heater it will correct this? Thanks for this informative site. I replaced the water heater and it is working fine. Everything was installed correctly and the flame wasn’t yellow but wasn’t hot enough, I guess , but working now with no backdraft. Hi George, We apologize for not responding to your original comment, but we’re happy your new water heater is working without issue. And it sounds like you made the right decision! Since your old heater was back-drafting but wasn’t producing a visibly yellow or orange flame, then most likely the flue pipe inside the unit was either clogged with internal soot buildup or was damaged in some way, limiting the air flow through the flue resulting in the back-drafting. Flue pipes can sometimes crack or rust away over time and once the flue itself is compromised there’s not much that can be done to fix it other than replace the whole water heater. Thanks for the comments & the update on your situation – we wish you many years of good hot water with your new water heater! Hi Gloria, Good question. It sounds like you have an electric heater, so the hissing is likely a result of sediment build-up on the bottom of your heater and/or on the heating elements – a common side effect of heating hard water. (We describe the popping sound made by gas water heaters when this happens – electric heaters make a hissing or sizzling sound instead.) So ultimately, we suggest installing a water softener to solve the root cause and prevent further problems. Then, you have a couple of options to address the current state of your hissing water heater. You could simply try to replace the heating elements themselves, which may be cheaper than replacing the whole unit. (That’s one benefit an electric water heater has over a gas heater!) Since you just noticed this issue, you could also attempt to drain & flush your heater, and try to manually clean out the sludge buildup. However, that is a time consuming process that can also lead to other plumbing issues, because you’re dislodging sediment buildup that can then get carried throughout the rest of your plumbing system, potentially clogging up other fixtures. And, if you hire a plumber to do it, the labor cost could exceed the cost of a new residential heater. Or you could proactively replace the heater as you originally thought. However, with any of these options you’ll still have a recurring issue of sediment building back up unless you solve the root problem and install a water softener first. We hope this helps. Good luck! Thank you for getting back to me. Only 3 weeks ago, we installed a Culligan full house water softening system. This noise only started “after” the system was installed and I even wondered, is this noise happening because of the water softening system now working in the electric hot water heater? OK, should I still be concerned, or do you suggest calling my plumber to flush the hot water heater. Again, its only about 5 years old. If it is definitely the water heater hissing, and if Culligan can’t identify anything else that could be triggering the noise, then contacting your plumber to at least inspect the heating elements and tank for sediment buildup is still a good idea. Especially now that you have a softener, if you end up replacing the heating elements and/or flushing the tank, you’ll be starting with a relatively clean slate & should get plenty more life out of that heater going forward, and it will run more efficiently too. For a residential heater that’s only 5 years old, preventative maintenance is definitely worth trying before just replacing it, especially if it’s working correctly otherwise. When it starts up and is running we are experiencing a motor noise upstairs in our living space. Hi Donna, How would you describe the noise the new unit is making? Was your old water heater also a direct vent setup? And is it a powered direct vent heater, or just direct vent? It is difficult to say what could be causing the noise without knowing more specific details. However, if the unit is actually a powered direct vent unit, then it would have a powered fan assembly to help the exhaust gasses vent outside, and those blower motors can get a bit noisy when they are actively running. The noise could simply be that the new model is slightly different and a little noisier than the old one – especially if your old heater wasn’t a powered direct vent setup. That noise can sound even louder if the floors directly above the water heater are hard-wood. Sometimes simply putting an area rug down in the spot on the floor directly above where the water heater is located in the basement can really help absorb some of the vibrations that are causing the noise nuisance. But if the noise isn’t just that of a louder fan – say if the noise is more like a rattling or a tinkling – those would be indicative of other issues. Thanks for mentioning that corrosion can indicate that your water heater is having problems. I’ve noticed that my water heater has some corrosion. I’ll definitely have a professional come to take a look and see if I need repair or replacement. Thanks for sharing this as it is very helpful since it could really save a lot of people’s lives. Great blog!